The Democratic Republic of Congo is defending a $9 billion mineral deal with China that is holding up a major international agreement aimed at reducing the DRC's external debt. China's biggest investment deal in Africa would give state-owned firms the right to develop Congolese copper and cobalt mines in exchange for building roads, railways, hydroelectric dams, universities, airports and hospitals. But the International Monetary Fund is holding off on debt relief for Congo because it says the agreement could lead to an explosive growth in debt, in part, because it is financed on commercial terms at a time when low commodity prices mean mining revenue may not cover as much of the infrastructure costs as originally planned. Congolese Foreign Minister, Alexis Thambwe Mwamba says the agreement with China is good for Congo after generations of mineral exploitation by foreign firms. For more than 100 years, Mwamba says, the riches of Congo have served to develop foreign countries, but not Congo, in what he calls a geologic scandal. Some members of the Paris Club, an informal group of financial officials from several the world's richest countries, are critical of the agreement because it gives the consortium of Chinese state-owned firms financial guarantees, including specific revenue set-asides, that make China a privileged creditor. Congolese Foreign Minister Mwamba says it is not just about China. Mwamba says President Joseph Kabila's government is taking a new approach with partners to use mineral resources to help build the country's infrastructure. He says it is not only about China and that it could include business partners from Australia, France, Belgium and the United States who want to help ease poverty in Congo by investing in water and electricity. The foreign minister spoke to reporters following a meeting with U.S. Secretary of State Hillary Clinton. U.S. officials would not say whether Clinton brought up the Chinese mineral deal. When asked about China's growing influence in Africa, Clinton said she is not looking at what anyone else is doing, only at what the United States can do. The secretary of state did bring up the issue of illegal ore and diamond mining in Eastern Congo, the profits of which help fund militias there. "I think the international community must start looking at steps we can take to try to prevent the mineral wealth from the DRC ending up in the hands of those who fund the violence here," Clinton said. "Of course, you know that many of the mineral producers are very small operations; they are not corporations even. They are certainly not international. So this is a very challenging problem. But we are going to address it." 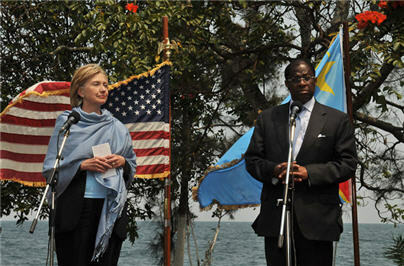 Clinton told President Kabila that she would like Congo to comply with the Norwegian-based Extractive Industries Transparency Initiative, which aims to improve accountability in oil and natural gas production as well as mining.